Scott Taylor took up my offer in 2008. Will anyone in 2011? If interested, let me know. As I'm scheduled to be placed on layoff from my current job on July 4 (the business location is closing), I'll probably have plenty of free time mid-Summer. The City of Virginia Beach's official City redistricting website is now under construction. The website is at www.vbredistricting.com If you look at it, you'll see the site plans to post all submitted plans, and will have the basic laws that apply. Got air conditioning? This afternoon's meeting of the Transportation District Commission of Hampton Roads (TDCHR) didn't, which probably helped hold the public portion of the meeting in Hampton to about 55 minutes. You'll love this: there was an issue with a contractor's work. The contractor said correcting it would require an $80k study and $500k-$2 million in construction. HRT staff bought the materials and fixed it themselves for $30k. Pat Woodberry of Newport News was elected TDCHR Chairperson for FY 2012, with Rick West of Chesapeake Vice Chairman. They assume office on July 1. 11 months through FY 2011, HRT is $1.48 million under Budget. 1. A new Patrick Henry Transfer Center will be built in Newport News on Roger Brown Drive, adjacent to the Mall. It will put the TC on City of Newport News (rather than Mall) property, and give bus riders improved restroom access. 2. A Federal grant will be utilized to put shelters at an additional 200 bus stops, doubling the number of stops with them. In addition, some cities are putting together their own shelter programs. 3. A new contract for external auditor. The second lowest bidder was chosen, as recommended by staff, the Operations & Oversight Committee, and the Budget & Audit Committee. The lowest bidder had no experience at such, their proposed team was too small and inexperienced, and their bid was based on far too few hours to get the job done right. Therefore, the judgement was that the low bidder didn't grasp the scope of the project. After a lengthy discussion, the contract was approved. No, it's not utopia at HRT. During the final nine days of May, the number of customer complaints was 251 above that for the same period in 2010. That was primarily due to a service board change on May 22 (board changes normally produce complaint spikes), and the operational impact from the move from the Ford plant back to 18th Street. The TDCHR then went into closed session to discuss a personnel matter. TEA Party: Plus Or Minus? In our latest poll question, one-third regularly go to regional board meetings, while two-thirds have never been. That may tell me more about my readership that it does about the general public. The new question: is the TEA Party a plus or minus for the Republican Party? The Transportation Planning Organization (TPO), Hampton Roads' Federally-mandated transportation board, met on Thursday. A representative from the Virginia Department of Transportation (VDOT) briefed the TPO on the ongoing study to expand the Hampton Roads Bridge-Tunnel (HRBT). Even under the "aggressive" schedule, the final Environmental Impact Study (EIS) won't be completed until Spring, 2014. The HRBT issue triggered a discussion about tolls and the economic impact of imposing tolls. Tolls should be on the Midtown and Downtown Tunnels within a year, in the prelude to the PPTA that includes a second tube at the Midtown. What would be the impact on already-troubled Portsmouth? How will tolls change traffic patterns, as some motorists go by different routes to avoid the tolls? The TPO passed both its FY 2012 Budget and the FY 2012-15 Transportation Improvement Plan (TIP). There was a briefing by the Department of Rail and Public Transportation (DRPT) on passenger rail. The good news is that the process is already underway for replacing CSX's Appomattox River Bridge, which would allow three daily Amtrak trains to Norfolk sooner. We're being hit with the story about the City of Virginia Beach looking to giveaway $3.1 million in land to the YMCA to build a complex, including a 50 meter competition pool, at Dam Neck and Landstown Roads. I had a brainstorm this morning while getting ready for work, and wanted to throw it out as food for thought. Some facts here. One, supporters claim a need for a 50 meter competition pool in order to put Virginia Beach on the map for swim events. Two, opponents have serious problems with a land giveaway to a private club. Three, the only Council district in Virginia Beach lacking a city recreation center is Centerville District. Four, in 2004 Bob Dyer raised the issue of the lack of a Centerville recreation center during his winning campaign. See where I'm going here? Why not build such a pool, but as part of a public City of Virginia Beach recreation center in Centerville District? Supporters get their pool, opponents don't have our public assets being given away to a private club, and Centerville gets it's rec center. While I'm at it, I'd like to suggest a location along Indian River Road west of Interstate 64. That would put it on a major thoroughfare, and it would be served by public transportation (HRT Route 12). With the amount of tacky commercial along that stretch of road, we can take the land by eminent domain and build something that looks much better. On Tuesday evening there was a meeting at Windsor Woods Elementary School to unveil the draft Rosemont Strategic Growth Area (SGA) plan to the public. The meeting was fairly-well attended. Paul Ostergard of Urban Design Associates gave a nearly hour long presentation on the plan. Rosemont is envisioned as an urban residential village, with the plan envisioning 1,776 multi-family units, 756 single family units, and 549 units in mixed-use structures. There were a pair of extensions added to the study: south on Rosemont Road to South Plaza Trail, and westward on Bonney Road. When a traffic model was run on the SGA at buildout, it flowed better than it does there today. After the presentation, residents broke out to three tables for comments and questions: streets, parks & open space, and land use. The plan is on the City's website. 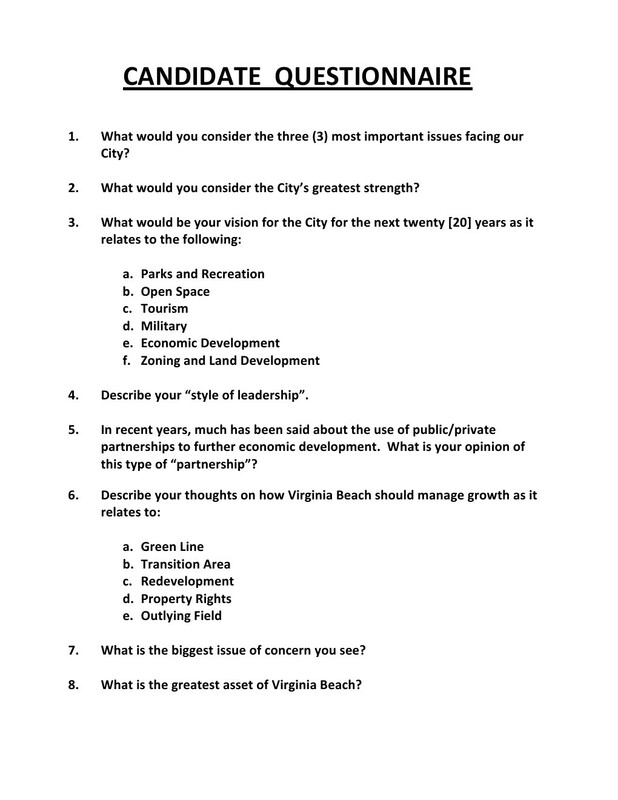 If you haven't seen it yet, posted below is the candidate questionnaire for the seat on the Virginia Beach City Council being vacated by Rita Sweet Bellitto. What struck me are two glaring omissions. 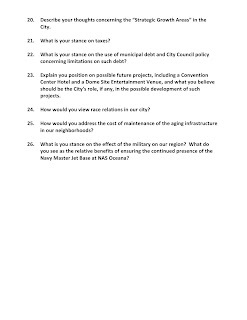 First, no specific question on transportation, despite that being a regular Top Priority coming out of Council Retreats. Second, nothing on the ongoing City Redistricting process, which will be one the hot button issues the interim appointee has to deal with. Two questions caught my attention. 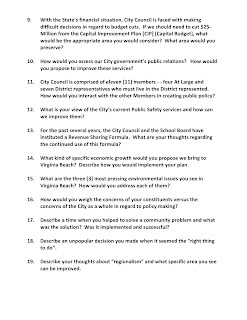 On Question #10, does the City government think they have simply a public relations problem? While the City is handling that matter much better than 10-12 years ago, there are other measures they could take but aren't. In addition, I want to see John Moss' answer to Question #14. 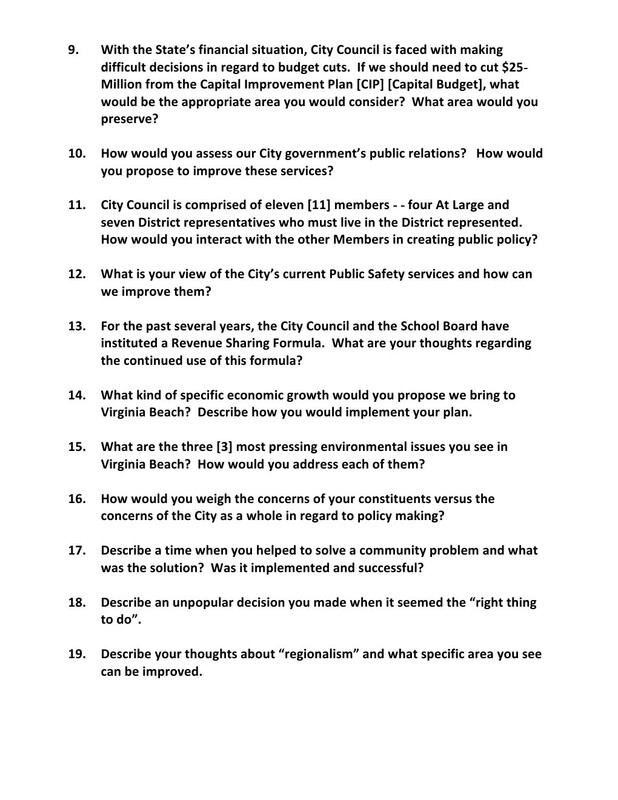 How does he reconcile trying to grow the economy with the draconian steps his extremist Virginia Beach Taxpayers Alliance (VBTA) wants the City to take, which would inevitably send investment elsewhere? The last two editions of The Virginian-Pravda have brought us news of looming proposals by the City of Virginia Beach. Yesterday's edition told us it is being considered to allow an encampment for the homeless. The City should approve such. The City of Virginia Beach owns plenty of parcels of land. Find one near a bus route, preferably buffered by commercial. (Adjacent residential neighborhoods would object.) Install a water source, if cost-effective. Our city always has a shortage of bunks for the homeless. (I Wish I Didn't Have This Post To Make, 10/26/09). Giving them a safe space for tents could be a huge help. In addition, it would put those homeless at a single identifiable point for any services to be delivered to them. Only in Virginia Beach: our City is considering giving away $3.1 million in land so the YMCA can build a private pool for their members. What sick puppy thought of this one? As the line goes, YMCA stands for Young Men Can't Afford. You want to give away our land for a pool that many of our residents will never be able to use?!? Shame on any Councilman who actually votes for such. The information was e-mailed out yesterday: the Thursday evening (June 16) Virginia Beach City Redistricting Meeting will be 6 P.M. at Meyera Oberndorf Central Library. Some plans have already been submitted, and I saw a copy of one this past Thursday night. This past Tuesday night I was over in Norfolk to see if I could learn anything from their Redistricting process. What I got was a great seat for when Rodney Jordan dropped his bombshell. For those who haven't heard, he offered a plan which would convert Norfolk's Ward 1 (now represented by Andy Protogyrou) to a minority-majority ward. Not African-American majority, but total minority. It does so by pushing Ward 1 south, and drawing Ward 5 (Tommy Smigiel) all the way west in Ocean View through Willoughby Spit. Obviously it would shift power in Norfolk, but it would also have notable effects at the regional level, too. Virginia Beach inclusionists should support the efforts of Jordan & friends, as having an amiable government in Norfolk City Hall would obviously help the cause for inclusion here. Have You Ever Been To A Regional Agency Board Meeting? 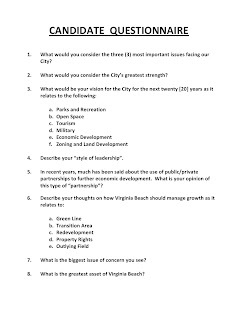 In our latest poll question, I asked if you believed the Virginia Beach city government cares about the average resident. The replies on this one were all over the place: 31% felt Very Much, 6% Somewhat, 38% Not Much, and 25% Not At All. Last night the Council of Civic Organizations (CCO), Virginia Beach's civic league federation, had a program on High Speed Rail and light rail. There were two presenters. First, Thelma Drake, Director of Virginia's Department of Rail and Public Transportation (DRPT). Second, Marie Arnt of Hampton Roads Transit (HRT). Marie is public outreach person for the Virginia Beach Transit Extension Study. Conventional rail Amtrak service to Norfolk will begin in 2013 with one train each day. That should be boosted to three trains per day once the Appomattox River Bridge is upgraded. On the CSX line outside Petersburg, it is a single track railroad bridge. Virginia may assist in upgrading to two tracks. 90% of the funds for the Norfolk service are in the bank, with the track upgrades on the Norfolk Southern line to Petersburg already begun. Two new mass transit agencies have begun service in Virginia in 2011, with two other localities studying implementing transit. When businesses look at an area for a potential relocation, one of the first things they'll ask is "How would employees get to work?" That spawns transit service. The Federal government may cutoff our region's Federal highway dollars, based on air quality, if we do not adequately do mass transit to try to mitigate the impact. Given that air quality here is in the yellow zone of Federal requirements, that's a serious issue. The #1 issue employers in Hampton Roads raise with Drake: parking. That's not a problem if your employees take mass transit to work. 1. A motor coach service being launched from Roanoke to Lynchburg to feed into Amtrak trains there. Some want trains extended to Roanoke, with this being a precursor to see if the market's there. Lynchburg's Amtrak service is carrying three times the projected passengers. 2. A partnership with the Army for moving soldiers. Each week 1,000 go from Fort A.P. Hill to Fort Lee on Monday, and return on Thursday. The Army had been using motor coaches, making for a horde of buses on the road. They're now making the trip on Virginia Railway Express (VRE) trains. There was little to report on the timed-out Virginia Beach study, so Marie spent most her time talking about Norfolk's Starter Line. At HRT "everyone is working their butts off" towards revenue service launch. Most likely trains would run on a Saturday and Sunday with no fare required, before a revenue launch on a Monday morning. Arnt worked her way down the line west to east, noting features at each stop. She also touched on feeder bus service and the light rail safety program. The golden nugget: the final hours of operation at launch were agreed to at a Tuesday evening meeting. It will be Monday - Thursday 6 A.M. - 11 P.M., Friday & Saturday 6 A.M. - Midnight, and Sunday 11 A.M. - 9 P.M. I'm elated: I can go to a weeknight Admirals game, and that extra hour of service means I can catch the train out afterwards. After last night's CCO meeting (next post), I was threatened by a well-known Virginia Beach personality. If I continued to make the one point online, I would need to "watch my back", and was told "I will destroy you." You may get me, but you'd be destroyed in the wake of it. Michael Jemar McLean has been charged with second degree murder and use of a firearm in the shooting of Tyler Lynn-Gainous. I thought I knew him: he lived two apartments up from mine. He was one of the nicer neighbors to me. He was usually amiable and mild-mannered. Even when he appeared to be agitated, he would quietly keep it to himself. Therefore, I'm somewhat surprised that he would shoot someone in cold blood as charged. On the other hand, I never knew of Mike having a steady job. He would talk of getting one, and doing things to improve himself (like his older brother did), but I never knew of him doing such. I had a beer with him on Thursday evening, less than 24 hours before the murder. (Mike knew I normally keep beer in my refrigerator as a social inducement for neighbors.) He laughed at how fast I drank mine. Another point: where did the gun come from? The standard Aden Park lease prohibits tenants from keeping firearms in their units. Simply having a gun at home would be grounds for eviction. Second degree murder carries a penalty of anywhere between 5-40 years. It's the default charge in a case where the Commonwealth's Attorney doesn't have enough evidence to prove first degree or capital murder beyond a reasonable doubt. Use of a firearm is a distinct charge in Virginia. Using a firearm in the commission of a felony carries an automatic 3 year penalty for first offense, 5 years for second offense. For Tyler's family and friends reading in New Jersey, Virginia has jury sentencing. The jury not only determines guilt or innocence, but passes sentence if they convict. Our juries tend to be tougher than judges. Usually there are small children outside playing on Jasper Court from after school until 7:30-8 in the evening. They still haven't returned to their normal play patterns. We're not over this tragedy until parents believe it's safe to send their children outside. Hampton Roads Transit's (HRT) move from the temporary garage at the former Ford plant to the new permanent facility on 18th Street in Norfolk disrupted service among Norfolk garage buses for 1 1/2 days, but everything is suppose to be back to normal now. However, I have two points for HRT in the wake of this snafu. First, since the move to the Ford plant from 18th Street didn't cause a disruption, why did the move back trigger one? Second, why wasn't specific information provided to bus riders during this period? Had they been told exactly which routes would be disrupted and how, they could have planned around the temporary gaps in service. Instead, there was simply an announcement about "limited service" with bus riders left to guess where the holes were. As with the Nor'easter in November, 2009, this should be a lesson to HRT that it needs to improve getting information to passengers in the event of a service disruption.